Arun Shourie, a minister in the Atal Bihari Vajpayee Cabinet, has hit out at the Narendra Modi government, saying its economic policy was "directionless" while the social climate was causing "great anxiety" among the minorities. "The government seems to be more concerned with managing headlines than putting policies in place. The situation is like the many pieces of a jigsaw puzzle lying in a mess with no big picture in mind about how to put them together," he said in an exclusive interview with Headlines Today's Karan Thapar ahead of the first anniversary of the Modi government. The government lacks clear thinking. The government has good ideas but poor in implementation. There is a big gap between perception and promise, and projection and performance. The government must become low profile. Shourie, who is not active in the Bharatiya Janata Party these days, said despite promises the fears of foreign investors on retrospective taxes and incentives for manufacturing have not materialised on the ground. "They (investors) require stability and predictability," he said, adding that the concern expressed by eminent banker Deepak Parekh on the situation on the ground should be seen as a "wake up call". Asked if the Modi government had done enough to put India on growth path, Shourie said that it was "all hyperbole". "Such claims are meant to grab headlines but lack substance," he said. Shourie handled the ministries of Disinvestment, Communication and Information Technology in the Vajpayee government. "Government is talking big on economic matters but nothing is happening on ground. Delivery is missing," he added. In an apparent reference to Finance Minister Arun Jaitley, he said the government lacked a stable approach in dealing with investors and that "lawyerly arguments" would not convince them. He was also critical of handling of the tax issues which was keeping foreign investors away. "First it alienated them but now it has made them laugh. You come out as bullies." 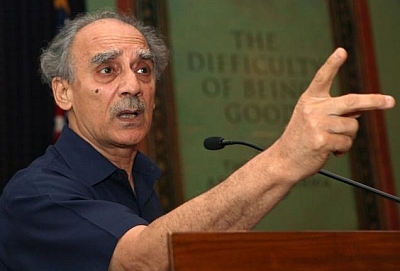 On the social front, Shourie said there was "great anxiety" among the minorities in the wake of the incidents of attack on Christian institutions and the "Ghar Wapsi" and "Love Jihad" campaigns. He was critical of Modi's "silence" on issues relating to social tensions on account of activities of right wing organisations and statements by some party MPs and leaders. "You tweet when Sania Mirza wins championship or greet someone on birthdays but you don't do such things when moral questions are involved. People doubt why he is silent," he added. Referring to former IPS officer Julio Ribeiro's recent anguish that he felt like an "outsider" against the backdrop of attacks on churches, Shourie said when people of such standing make such remarks it means things have gone too far. "We have to wake up," he said, adding that people like Ribeiro and former Punjab top cop KPS Gill had saved Punjab for India. Talking about alienation of Muslim youth in the context of "Love Jihad" and Moradabad violence, Shourie said, "if 100 Muslim youth come together and conclude that we are not getting justice here and that ISIS is right then we have a problem at hand". Replying to questions, Shourie said Modi, Amit Shah and Arun Jaitley were running the party. "It has offended the opposition as well as frightened the members of the BJP," he said. "They are the ones responsible for mistakes and they are also the Supreme Court. The three leaders are not getting proper feedback and no corrective action takes place," he said. Shourie also invoked the controversial monogrammed pin-striped suit that Modi wore during his interaction with US President Barack Obama earlier this year. "It was inexplicable, incomprehensible and a big critical mistake," Shourie said. "I fail to understand why he accepted and then wore that suit. You cannot take Gandhiji's name and wear such a thing," he said, adding, it was good that he disposed it off quickly. Shourie rued the delay in filling up top vacancies in key institutions like the CVC, the Central Information Commission and the Election Commission. "The vacancies are incomprehensible," he said. Shourie disapproved of frequent promulgation of ordinances, calling them "ill advised". The former minister also stressed the need for taking the opposition along if the government wanted to push its economic reforms. "A more embracing attitude is required... There can be no reforms without opposition support," he added. Shourie also referred to BJP President Amit Shah's use of the word "uproot" at a rally in West Bengal when he spoke about the need to dislodge the Mamata Banerjee government. Speaking about the Modi government's foreign policy, Shourie said it has correctly regarded that China is the "principal challenge" for the country in the long run. But, he said there were "contradictory signals" on Pakistan. "There should be steadier thinking, steadier guage." "It is not a good idea that in the fascination for out of box ideas to ignore the institutional memory embedded in the Ministry of External Affairs and outside," he added. Shourie while giving his assessment of the Prime Minister said," I like him. He is the only person who can give us leadership."